I have the totally cliche gardening problem of too much zucchini, and giant ones at that. So, we have been experimenting with a number of zucchini recipes. Translation: everyday we are eating something with zucchini in it. Some of these were better than others - here's a roundup of what we've tried so far. Zucchini Tots from The Curious Country Cook - I was the only one who liked these. She claims they taste like tater tots, but I didn't think so. More like little zucchini quiches. Zucchini Fritters from Damn Delicious - Draining the zucchini really made these come out crisp, not soggy. I liked them, but no one else did. Pfft. Blueberry Zucchini Cake from I am Baker - I made this with my friend Stephanie, who is vegan, so we subbed flax seed for the eggs. Oh, and a banana and applesauce for some of the oil. We baked it in little loaf pans. It was very good and very sweet and very popular with Matt and the girls. We didn't mess around with the frosting. Chicken and Zucchini Poppers from One Lovely Life - These were tasty, healthy little meatballs. I used italian seasoning and basil instead of cumin and cilantro so they weren't really Mexican/popper-y as the recipe intended. Still good. Best Zucchini Bread Ever from Simple Bites- Well, no. It wasn't. It was good, I guess. I can't pinpoint what I didn't really like. The texture, maybe? I didn't use freshly ground spices like she said to? I cut the sugar a little because we used sweetened vanilla yogurt? Anyway, I'm still looking for a go-to zucchini bread recipe. Blueberry Zucchini Muffins from In Erika's Kitchen - Very yummy. Definitely a treat, as they were pretty sweet. I subbed applesauce for about a 1/3 of the oil and stevia for 1/2 cup of the sugar. Parmesan Zucchini Wedges from My Blessed Life - I ate a bunch of these, but Matt tried one bite and gave up and I didn't even attempt to give it to the girls. I left out the rosemary and just used cooking spray. I'd make them again to take to a potluck - somewhere with more adventurous eaters. 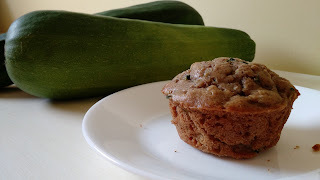 Healthy Zucchini Muffins from Gimme Some Oven - These were a hit! Moist, healthy, not at all too sweet. Cadence said, "Mmm...these were sooo good! I want another one." Easy Zucchini Bake Casserole from Canuck Cuisine - This is another one I didn't bother feeding my family. I took it to a party. I liked it. Simple. I used two eggs instead of one egg and one egg white (ain't nobody got time for separating eggs around here) and used garlic salt to season the zucchini. Baked Turkey Zucchini Meatballs from Baker by Nature - Delicious. I halved the recipe and had just the right amount for our family for dinner. I used frozen chopped yellow onion (I hate chopping onion!) instead of red onion. I didn't use her marinara sauce but it sounds good. I think making it again as a full batch and freezing half would be a great idea. 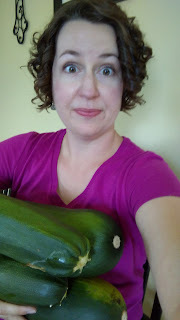 And now, off to make some zucchini bread!